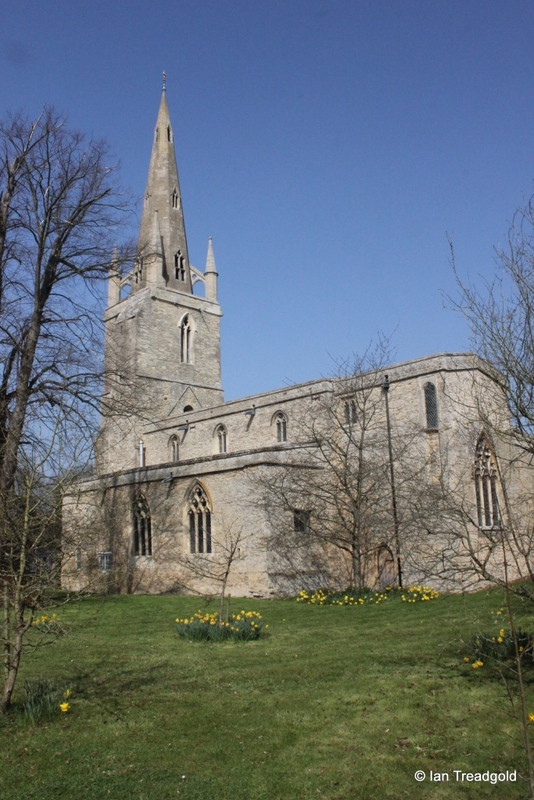 The church of St Peter’s in Harrold is situated to the south of the village close to the River Great Ouse and the Harrold Odell Country Park. 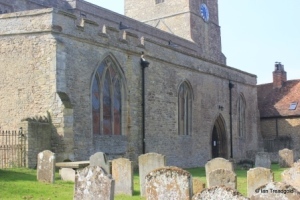 Parking is limited around the church itself and it is probably best to use the car park in the Country Park and approach on foot. The church consists of a nave and chancel with aisles to the north and south. 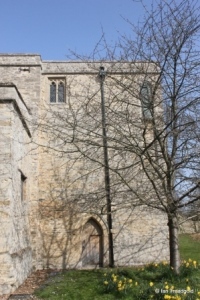 The south aisle has been extended westwards to form a vestry and there is no south porch. 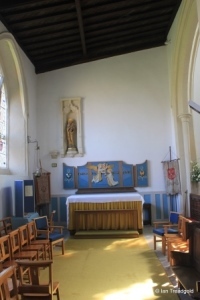 The north aisle has been extended to the east to form a Lady chapel. 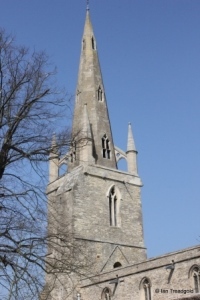 The tower to the west has a recessed spire supported by pinnacle buttresses. The chancel is around 21 feet by 15 and the nave some 46 feet by 20. The north aisle extends the length of the nave and chancel and is around 14 feet wide. The south aisle is around 10 feet wide and runs the length of the nave and beyond into the vestry. The tower and steeple are around 14 feet square and some 140 feet tall. 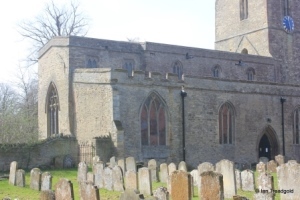 The site of the church must be viewed with regard to the medieval layout of the village with the Augustinian Priory which was situated in the lands running from the south of the church down to the river Great Ouse. 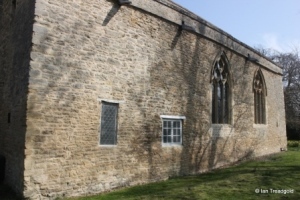 When the Priory fell into ruin following the dissolution, Harrold Hall was built on the site and the gardens of the Hall ran to the south and east walls of the church. The Hall itself was demolished in 1961 with modern houses and Hall Close occupying the space. 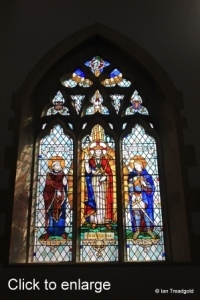 The south aisle of the church has a simple wooden three light east window and two restored three light trefoiled windows with net tracery above under two-centred arches. At the eastern end of the aisle is the organ. 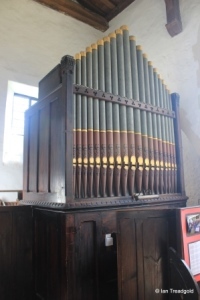 The organ dates from 1869 and was moved to its present location from the north side of the chancel in 1965. 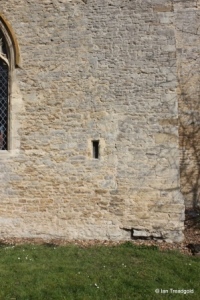 To the east of the aisle are indications in the masonry of alterations that could have been a south door from the priory – all that remains now is a small window. 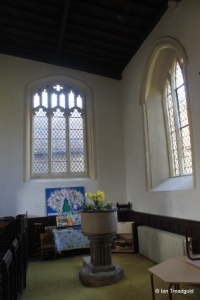 The western end of the aisle is occupied by the vestry with two appropriate windows. 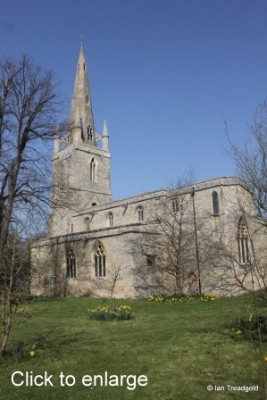 The west tower is of two stages with the octagonal steeple recessed inside the outline of the tower. 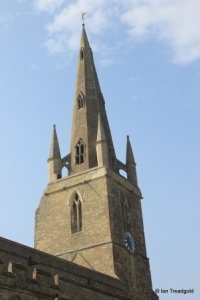 The steeple has three sets of lights aligned to the compass points and is buttressed in the corners with pinnacles surmounting the buttresses. The tower itself has diagonal buttresses and two-light trefoiled openings with quatrefoil designs in the heads under pointed arches on each of the faces of the second stage. 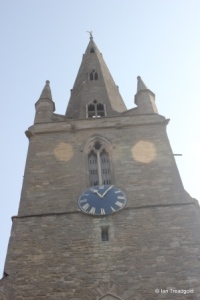 There are clock faces to the west and north of the tower. The clock itself was installed in 1887 to mark Queen Victoria’s Golden Jubilee. 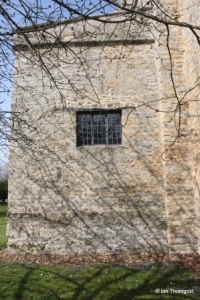 There is a projecting stair turret in the south-west corner of the tower accessed internally. 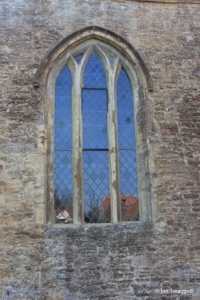 The west window is of three cinquefoiled lights with restored flowing tracery above under a two-centred arch. 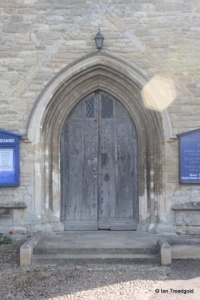 The west door is now the main entrance to the church and there are clear signs of an earlier porch over the doorway. 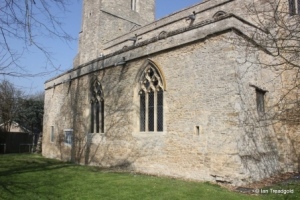 The north aisle has a west window with two windows surrounding the north doorway and a third window at the eastern end into the chapel. 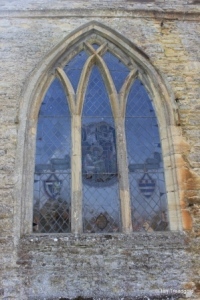 The west window is of three cinquefoiled lights under perpendicular tracery with a four-centred arch. The two western windows of the aisle are three simple lancet lights with intersecting tracery under two-centred arches. 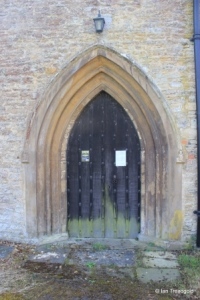 The north door, now disused, is quite tall and pointed. 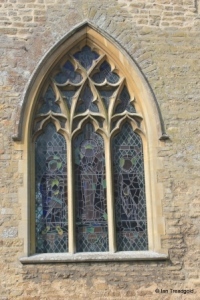 The western window is of three uncusped lights with intersecting tracery under a two-centred arch. 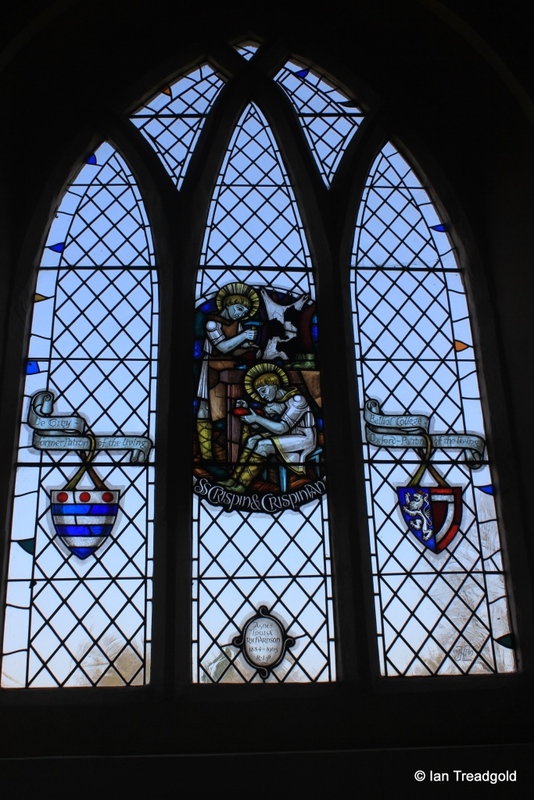 The glass depicts Saints Crispin and Crispinian, patron saints of cobblers, shoe-makers and leather workers. These trades were an important industry in the Harrold area until the 1970’s. 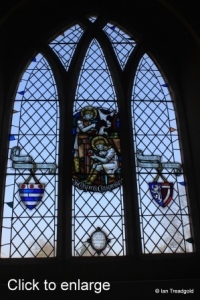 The window was installed in 1967 in memoriam of Agnes Louisa Richardson who died in 1965 and also bears the arms of the De Grey family and of Balliol College Oxford. There is no east window to the Lady Chapel. 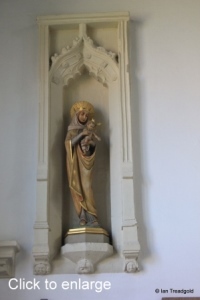 The Lady chapel was refurnished in the 1960’s and the statue in the niche above the altar of the Madonna and Child was erected in 1960. The parapet above the Lady Chapel is the only part of the church that is embattled. The clerestory above the nave has three two light windows on each side all under two-centred arches. The roof was reconstructed in C19 and the original was clearly much steeper as can be seen on the east side of the tower. 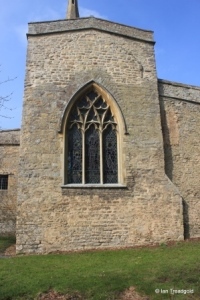 The chancel clerestory has two more on the north side but under square heads whilst on the south, there are two different windows with one matching the north but the eastern window on the south side being a long single light window. This window was clearly almost twice its current height in the past but is now bricked in leaving the high cinquefoiled light of today. 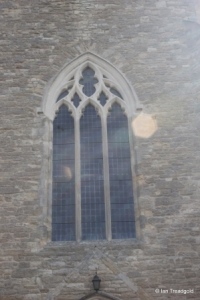 The modern east window dates from 1951 and is of three trefoiled lights with geometrical tracery under a pointed arch. 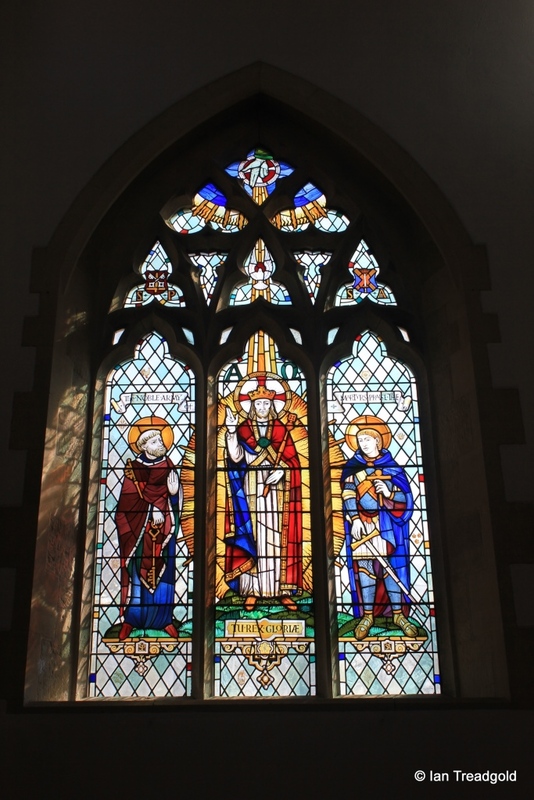 It depicts St Peter and St Alban on either side of the risen Christ.. The east end shows clear signs of alteration from when the clerestory level was added in C14. 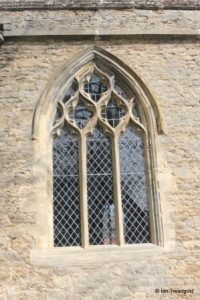 Originally the east window was a C16 square headed window replaced in alterations in 1890. 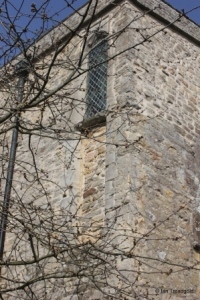 The south side of the chancel has no windows as such, just the two high clerestory windows mentioned earlier. 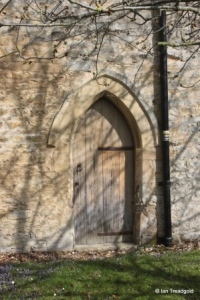 There is a priest's door under a pointed arch. 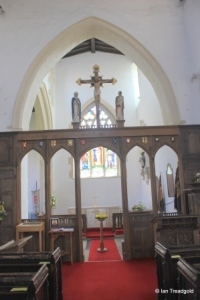 The rood screen is mainly Jacobean although the figures were restored and the shields added in 1947 as a memorial to the fallen of two world wars. 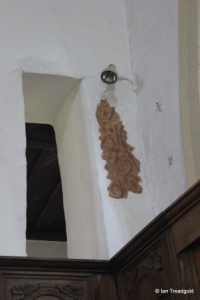 Above the screen to the north is a fragment of a C15 fresco exposed during redecoration in 1995. 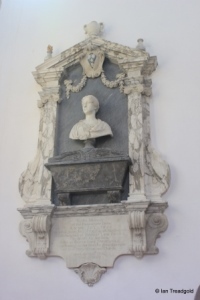 In the chancel is a monument to Dame Anne Jolliffe who died in 1732. 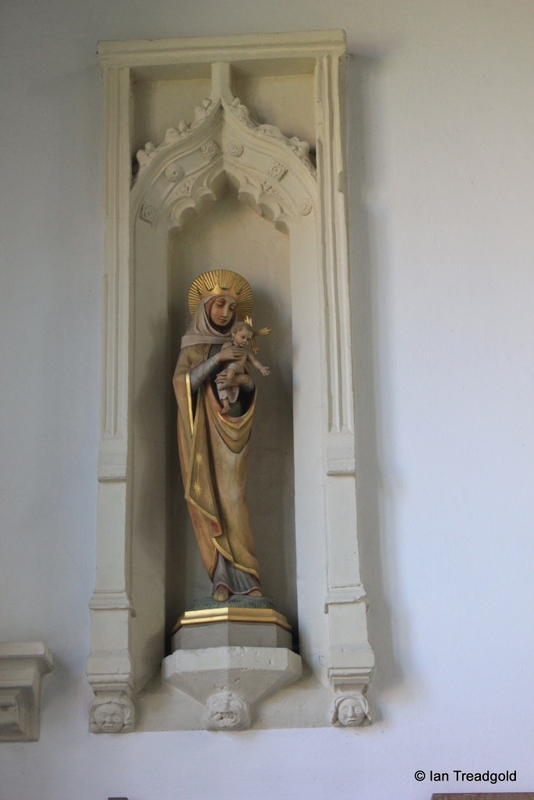 She was a local estate holder in the Harrold and Odell areas and established charities that erected and maintained alms houses in Harrold. 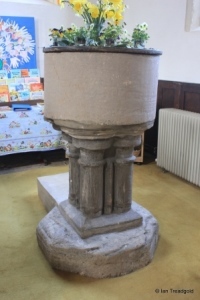 The font, at the west end of the north aisle, is a Norman bowl on C13 moulded capitals. Page last changed 12/04/2015. Reformatted 21/02/2016.